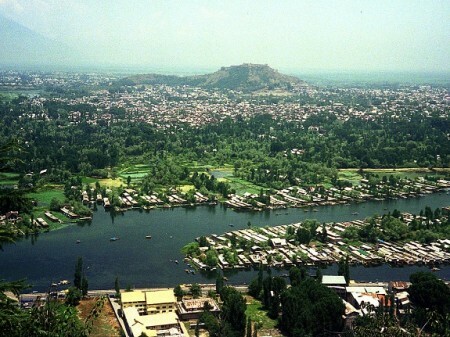 Srinagar is the well-known amidst the lovely queen summer capitals in India. Being the capital of India’s most beautiful state Kashmir; Srinagar has nevertheless been under a lot of political turmoil recently. However since the tumultuous times of 2003-2004, the city has revamped its security and tourist facilities and is now a safe and comfortable destination for tourists. The city is very beautiful especially in the summer months when, Srinagar sightseeing it draws thousands of tourists from India and abroad. Srinagar has lots of beautiful landscaping, gushing fountains, culturally rich monuments and wonderful natural beauty. Its gardens and lakes are of special interest as they have lovely structure; There are many lovely gardens in Srinagar as under. Nishat Bagh: The garden named Nishat Bagh is situated right on the bank of the famous garden of bliss. It’s lovely landscaping and exuberant foliage has earned its name as Garden of Bliss. Shalimar Bagh: The Mughal Garden which flanks the lovely Dal Lake as constructed by Jahangir is known as Shalimar Bagh. This is also known as Garden of Perfume. Nehru Garden: This is 15 km away from Dal Lake and has serious floricultural practices operated by Jammu Government. Sample local Khawa here and if you are lucky you might be able to glimpse the 168 varieties of Tulips blooming in the Tulip garden. Hazratbal Mosque: This is a famous mosque and probably the most beautiful religious monument in India. The mosque is marble white and there are a lot of options outside for sampling Mughlai and Kashmiri snacks. Hazrati Youza Asouph: This is also known as the tomb of Roza Bal and also obliquely referred to be the tomb of Jesus. Photography however, is not permitted here. Shankaracharya Mandir: This is one of the few Hindu temples in Srinagar. There is a 25 steps flight to the temple which is perched atop a hillock and the place has an amazing view. Monuments of Srinagar are very beautiful like the Pari Mahal and Parihaspora ruins. Srinagar is such a beautiful city that you can just spend your days in careful abandon in the lap of nature. However there are many activities that are a must do while you are here on Srinagar tourism. Shikara Ride in Dal Lake will let you enjoy the magnificent view of the city. The average cost of a Shikara ride is 600 INR. There is a village in the lake which has a floating vegetable and flower market. Paragliding is organized from the Astanmarg Point near the Harwan Garden. You can opt for either the 15 minute or the 1 hour ride from this point and it offers splendid opportunities for the adventurous soul. Srinagar sightseeing and trekking in Srinagar will offer opportunities for nature viewing, adventure and exercise. Alpine lakes like Nundkol Lake, Satsar Lake and Vishansar Lake are also covered in the trekking circuits. Kashmir Treks and Trekking Srinagar Express are two organizations in Srinagar which offer beautiful trekking expeditions. For the shopaholic, Srinagar is a wonderful destination as the local arts and crafts here are exquisite. Here are a few must buys. Pashmina or Fine Cashmere shawls are finely spun and so light that they can be compressed through a wedding ring. These shawls are exquisite are wonderfully embroidered with traditional floral patterns. The woodwork of Srinagar is quite famous and you can shop for bangles, toys, artifacts, show pieces and carved boxes. Shop for saffron, Kesar and dry fruits that are available in abundance here. Chain Stitch Rugs in English and Kilim Design are also available at reasonable price and stunning variety. Check in at the Royal Kashmir Palace in Srinagar to sample the famous 36 course of Wazwan. Dig into Seekh Kebabs, Yakhni, Rista, Gushtaba, Aloo Dum, Shamam, Tujji, Lavash and Mint Paste. Kashmiri Naan with sultanas and Nuts are also very delicious. Go straight to Lal Chow in Srinagar as it has the best Kashmiri food. For sampling delicious beverages check out Café Robusta and Café Arabica on MA Street. The easiest route to enter Srinagar is by taking the train which has a major stop at Jammu and then by taking a 3 hour cab ride to Srinagar City. There are also dozens of State buses that commute between Jammu and Srinagar on a daily basis. However it’s best to opt for State Transport operated ones for Kashmir Tour and Srinagar sightseeing. Srinagar has its own Airport which is also known as Sheikh Ul Alam Airport. There are steady flights operated by Jet Airways, Jet Lite, Spice Jet and Indigo which sometimes have a mid-stop at Jammu. Most of these flights come from Delhi and Mumbai. It’s very important to keep Visa and personal Identification papers ready as the city is filled with check posts where papers are scrutinized.